Following some unexpected delays in construction, Dignity Health has opened their new Arizona General Hospital on the northwest corner of Ellsworth Rd and Elliot Rd. Arizona General Hospital-Mesa is a full-service health care facility with 50 inpatient beds, two operating rooms, a lab, radiology, and an emergency department operating 24/7. Local residents have eagerly awaited the opening of the hospital which was announced in late 2015. Houston-based builder PMRG completed exterior construction in July 2016 with a scheduled grand opening in early 2017. However, delays pushed back the grand opening until November 2018. The opening of the hospital brought an initial 100 long-term jobs to the region at opening, though Dignity Health predicts that the number of jobs will triple as the hospital grows to full capacity. “The new hospital campus is equipped with the latest clinical and diagnostic equipment to meet the needs of our patients,” said Terry Ambus, Chief of Staff at AGH Mesa. 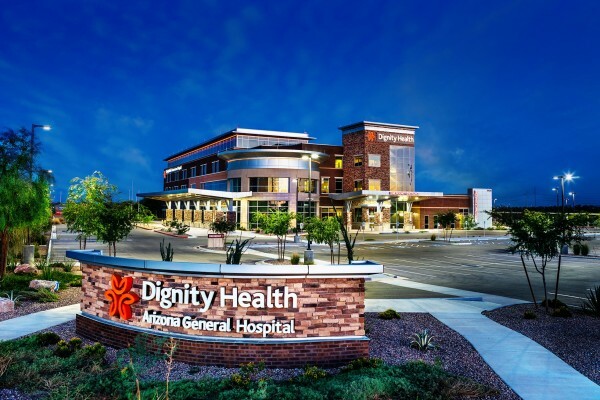 The new 92,000 square-foot hospital is the third Dignity hospital in the East Valley, along with Mercy Gilbert Medical Center at Val Vista and the 202 and Chandler Regional Medical Center on Dobson north of the 202.